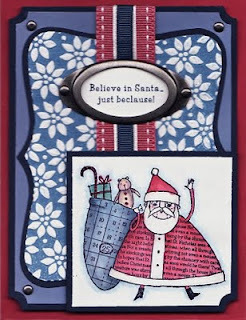 Sorry that I haven't posted anything in a week or so, I'm participating in Veej13's New Christmas WOW swap on Splitcoast. I signed up for two groups, so I'm busy rolling out 22 cards. I'm doing the red, white and blue Santa card below. I've put together all the Bordering Blue/Night of Navy layers, including the color emboss. Now I'm getting ready to start watercoloring the Santa image. If you're a SU demo, here's the link to Veej13's swap. Hers are always great! I don't usually participate in swaps, because I've never been happy with the return. However, Veej13 organizes great swaps and the returns are always fantastic! Here are her guidelines -- I highly recommend her swaps to demos who are interested in high quality swaps. • All card stock must be cut straight and layered evenly AND firmly attached – take the time to make a card that will make you proud! Have fun....just keep thinking of all the great swaps you'll get in return! Okay, not only did I not see this picture yesterday -- but I lost my first comment a few minutes ago!! This is spooky. Anyway, before anything else happens, I just want you to know that this is so very cute -- love the colors. Sandi -- I posted the photo from the post lower down on my blog. You're not crazy! I really like your card, I hope you get some awesome swaps!